Sitting here at our summer house in 75 degree weather, it’s hard to believe that the transition from summer to school is well under way. And though I’m about to go back to the city for my third week, things still do feel, well, transitional. These past three months have been so exciting, so rewarding and overwhelming, the seemingly constant switching of mindsets–from school to camp and back again–making my head spin in the best and worst ways possible. Worst because I do not deal well with change, and best because I’m learning to. I went through these very motions last year, and the year before that, and the year before that, but this time around seems particularly special in that while I am coming back for yet another year at the school I’ve known and loved since I was six, I’m coming with the knowledge that this will be my last. My head is consumed with thoughts of college and the future and life after the familiarity of this routine of mine. This year has been and will be a balancing act in more ways than one: academically, I am juggling my school work and college application work in an effort to devote ample time and attention to both; on the more personal side, I see this year as a time to navigate the interplay between the inherent difficulty of endings and the fear and nervous excitement that mark beginnings. I can’t fool myself into believing that I’ll escape this year without the usual stress that comes with being a high school student taking some toll on me, but I do hope that I can get better at seeing around it. I hope that I can enjoy weekends with friends, card games in my school’s courtyard, afternoons spent painting in the studio while the sun and the time both seem to slip through our fingers. I hope I can forget the future, at least for a moment, and plunge headfirst into all that this year will bring. 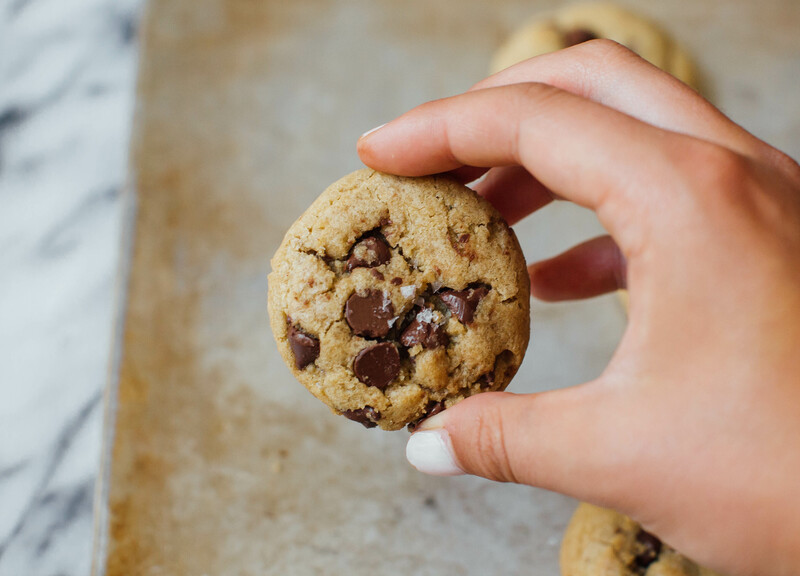 I’m not going to attempt to connect these sweeping (and, if we’re being honest, slightly melodramatic) statements with this recipe for mint chocolate chip cookies. But I will say that it’s recipes like these, the ones that come together in minutes and promise to leave you smiling at their straightforwardness rather than frustrated by some finicky, overly fussy step, that help explain why baking has stayed such a constant in my life. Recipes like these–chocolate chip cookies, banana bread, blueberry muffins–invite you to revel in their simplicity, and to share it with others. These cookies capture the nostalgia of a crispy-on-the-outside chewy-on-the-inside chocolate chip cookie, but are made with a fresh mint-infused butter. The result is timeless and new all at once. 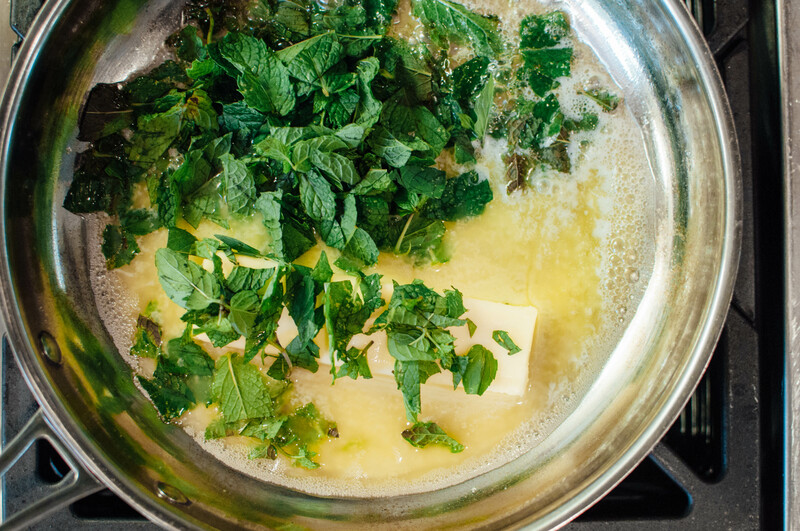 Melt the butter and mint in a saucepan over medium heat, then continue to cook for 2-3 minutes. The mint should be fragrant, and if you've got some brown bits of butter in the bottom of the pan, all the better. Set aside to cool to room temperature (30 minutes should do), making sure not to let the butter solidify. Strain the butter mixture through a mesh sieve, pressing the mint leaves into the sieve with a spatula to extract any remaining butter and juices. Place the butter and both sugars in the bowl of a stand mixer and beat with the paddle attachment on medium speed until the mixture is creamy, about 3-5 minutes. It'll start out pretty grainy, but hang in there! Then, add the egg and vanilla and beat for another minute to incorporate. In a separate bowl, whisk together the flour, baking soda, and salt. Gradually add the dry ingredients to the wet, scraping down the bowl as needed and making sure not to overmix. Stir in the chocolate chips, then scoop the dough onto plastic wrap or parchment, flatten slightly, wrap, and refrigerate for 1 hour. 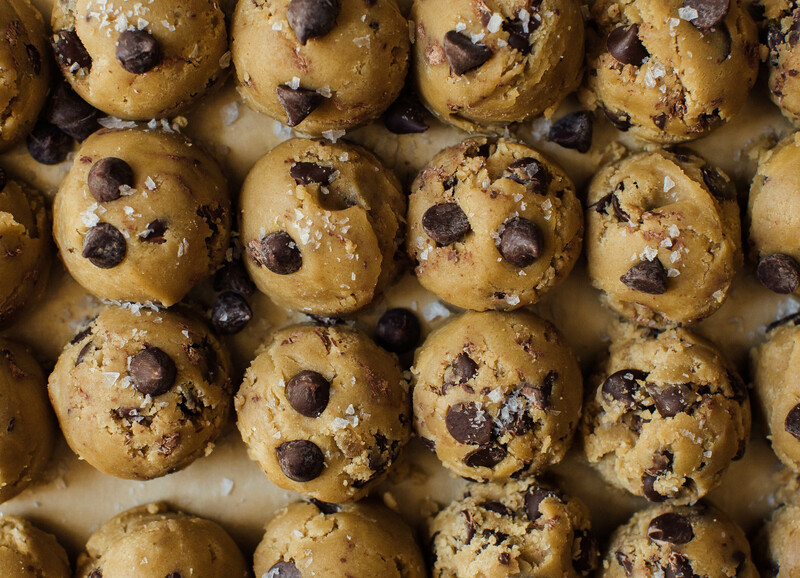 Scoop the dough into 1.5 tablespoon balls (you can go closer to a scant 1/4 cup for larger cookies) and space them evenly on the cookie sheets. 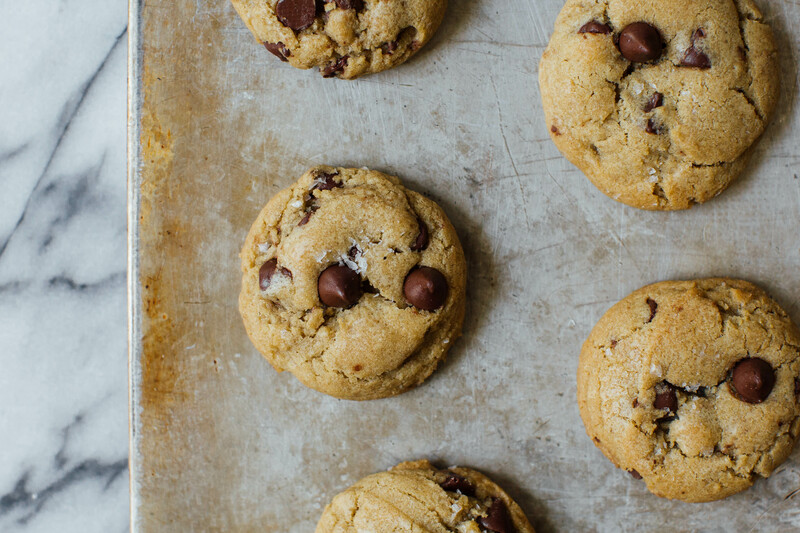 Top each cookie with a few chocolate chips and bake for 11-14 minutes, rotating the pans halfway through. The cookies should be golden, but still nice and soft in the middle. These look amazing! I am always looking for new and interesting uses for the mint that is growing like wildfire in my garden. And I love your recipes. You make them very easy to follow. Beautiful photos, too! Wow! Lovely post and fantastic recipe. Good luck with everything!